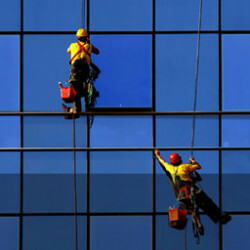 Corporate Clean Property Services offers a comprehensive range of window cleaning services to suit any situation. We have a team of professional window cleaners, who can provide a range of services from high rise commercial properties (which requires specialist expertise) to single story buildings. With more than 20 years experience in commercial window cleaning, Corporate Clean Property Services has the ability to efficiently and effectively clean windows at any height, and to safely overcome any access issues in a cost effective manner. Our window cleaning requires expertise with a range of tools and techniques including water-fed poles, ladders, elevated work platforms, abseiling techniques, swing stages, and others. From small retail shops to high rise office buildings, we have the expertise and resources to ensure that we maintain the highest standards of both cleanliness and safety. We also have extensive experience in accessing difficult windows safely and with the right equipment. Corporate Clean Property Services has full public liability insurance. Our staff are full trained in health and safety, cleaning techniques, equipment, and quality control, ensuring that the service we provide is of the highest possible standard. All commercial window cleaning work is carried out in a professional and safe manner – our window cleaners also provide a detailed safe work method statement and risk assessment prior to the commencement of all work. Why Is Cleaning Office Building Windows Important? It is important to regularly undertake window cleaning and window maintenance, as it protects the glass from degradation and mineral build up, providing cheaper maintenance costs in the long run. Glass that is simply not cleaned and maintained can lead to permanent and irreversible damage to the windows. We use super-light carbon fibre water-fed extension poles in combination with water de-ionisation and filtration units for large commercial work, and particularly high windows. In most cases this eliminates the need for access equipment and is a safe and effective method of window cleaning. This approach to window cleaning is also ideal for difficult-to-access areas that might traditionally require speciality equipment. It also has the potentially to the save on the costs of safe roof access and hoisting equipment on jobs. Our water-fed pole system passes the water through a de-ionisation and water filtration unit which results in 100% pure water. The ion exchange with the water provides an environmentally friendly window cleaning solution and eliminates the need for, and cost of, traditional cleaning solutions. The pure water is then applied at high pressure by the pole unit, cleaning away all of the dirt and deposits from the windows and leaving a streak and water-spot free finish. This process also saves time that would have been spent drying windows with a squeegee (if traditional cleaning techniques were used).